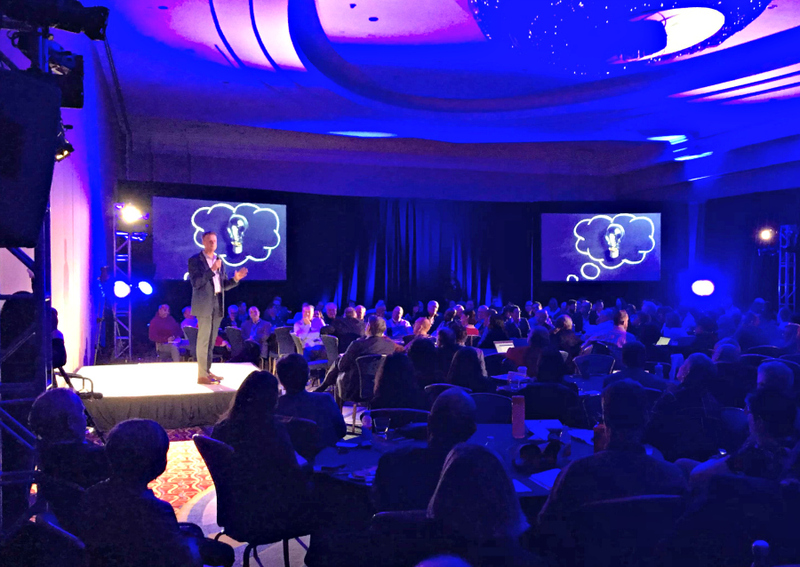 One of the highlights of the 2018 National Speakers Association Winter Convention was being selected to be a FutureInFIVE speaker. I had just five minutes on stage to deliver my predictions on the future of the speaking profession. If that wasn’t challenging enough, the format dictated that I have no control over my slides. Instead, they would automatically advance every 15 seconds! Needless to say, this was outside of my comfort zone—which turned out to be a very good thing because it stretched my capabilities as a professional speaker. I also got a great boost of energy from my conversation with Marki Lemons-Ryhal, a powerhouse of a personality who provides social media education and strategies to realtors around the country. Here I am, right before taking the stage, being interviewed by Marki about the importance of building strong relationships and blending technique with technology to galvanize business success. I think you’ll agree: Marki’s energy is contagious! If you are a real estate or mortgage lending professional and are interested in having me speak at one of your events, or if you would like to inquire about purchasing copies of my book, The Connector’s Way, at a volume discount for your team, let’s talk. You can reach me through my contact form. I look forward to connecting!